H9 introduce a new “volume” primitive that can live inside an object node. the idea here was to see how much I could do without having to rely on i3d files on disk. 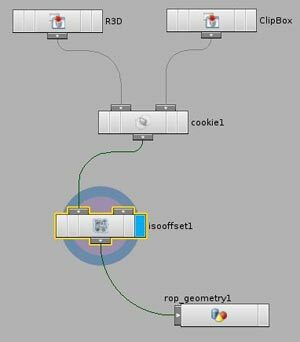 One way to create a volume primitive is to use the isooffset node. the isooffset node generates a sdf (signed distance field) from his inputs. but now you can also output a volume primitive , which shows up in the view port as a set of slices. isooffset also give you the option to directly save the sdf values , ie distance from the surface , inside the volume primitive. volume primitives can be filtered like i3d with the filtertype/filterwidth parameters. for the moment it’s not possible to create/edit attributes at “voxel” level (from a sop) like you could do with other primitives so I had to switch back to regular i3d to inject colors in my volume.There is a new vex (and vop) command “volumesample” that let you access the volume primitive data. this is the i3d shader I used to create an i3d file of my previous reconstructions. you can also have multiple primitives intersecting with no problems . I did a lot of volumic work in H8 and all I can say is that I wish I had all this back then ! Next I’m planning to spend some time in the shading department to see what’s new there. Cela ouvre tellement d’ouvertures au niveau creativite….